The New York Jets are in the market for a new starting quarterback after a dispute over a $600 plane ticket resulted in a broken jaw for their current starter, Geno Smith. Reserve linebacker IK Enemkpali, who was immediately released following the incident, confronted Smith about reimbursing him for a $600 plane ticket that was purchased for Smith but went unused after Smith was unable to attend Enemkpali’s football camp in Pflugerville, Texas, on July 11. When the situation escalated, Enemkpali “sucker punched” Smith, breaking his jaw and sidelining the 24-year-old quarterback for 6-10 weeks. Smith had reportedly been having an excellent training camp, and the Jets were becoming confident that the 2013 second round pick was finally going to play up to his potential in his third NFL season. Now the team will have to step back and reassess their options. Their first option would be to stay in house with Ryan Fitzpatrick and a pair of rookies in Bryce Petty and Jack Heaps. By all accounts, Petty has struggled to adjust to the playing in an NFL offense, and Heaps is simply not a threat to win the job. That leaves Fitzpatrick as the only player currently on the roster with a chance at winning the job. Another option for the Jets would be to acquire their starter through a trade. 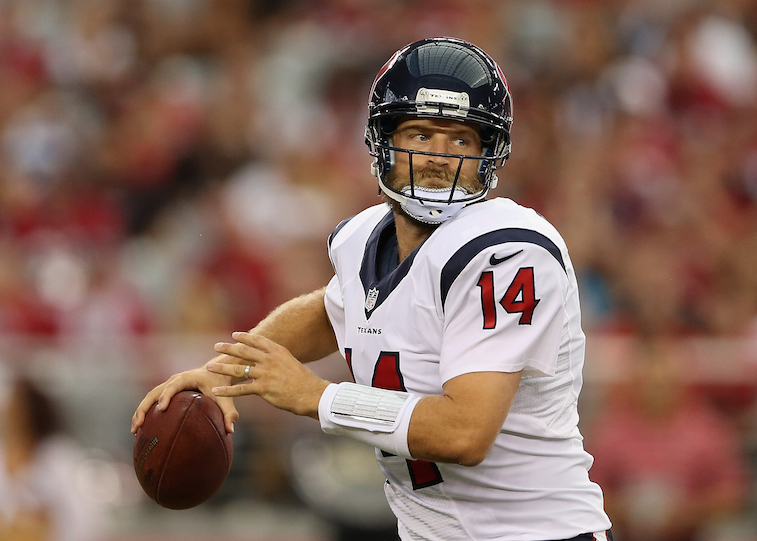 Guys like Brock Osweiler of the Denver Broncos, Kirk Cousins and Colt McCoy of the Washington Redskins, Zach Mettenberger of the Tennessee Titans, and Mike Glennon of the Tampa Bay Buccaneers could all be available for the right price. All five guys would be fully capable of competing with Fitzpatrick for the team’s starting job, but it remains highly unlikely that the Jets will be willing to give up a high draft pick for any of them. The most likely option for the Jets is to either stick with Fitzpatrick or sign a free agent off of the streets. 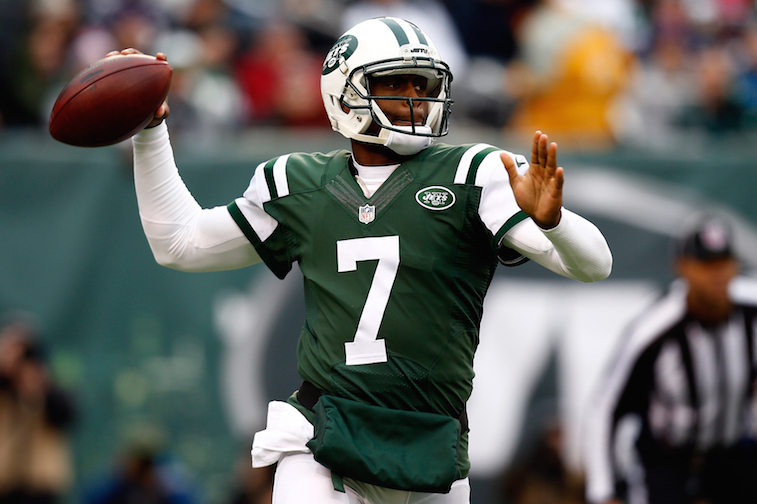 Here is a look at the five players most likely to win the Jets’ starting quarterback job. Fitzpatrick is the heavy favorite to win the Jets’ starting quarterback job. He has been with the team all offseason, and he had his best seasons as a starting NFL quarterback while playing under current Jets’ offensive coordinator Chan Gailey when they both were with the Buffalo Bills. Even though he has been inconsistent at times over the course of his career, Fitzpatrick has proven that he is fully capable of playing at a high level in the National Football League. 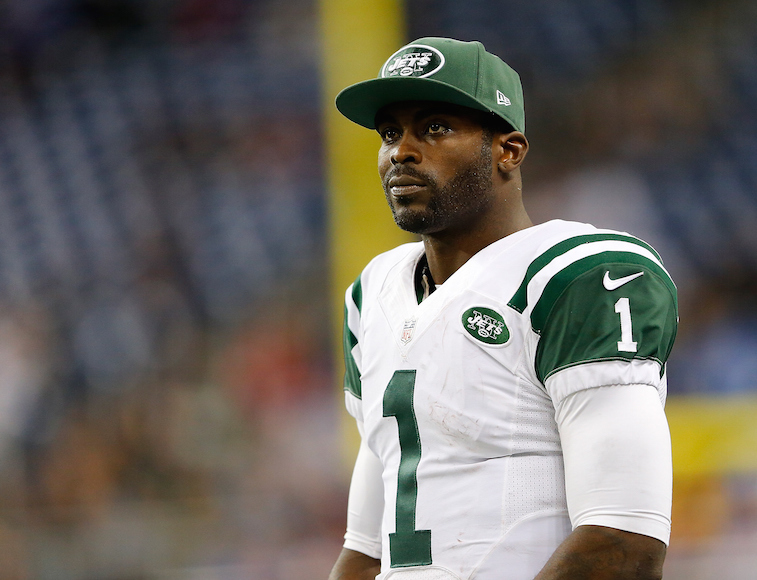 Vick was with the Jets in 2014, but made only three starts and struggled every time he was on the field. Nonetheless, he is familiar with the franchise and his skillset is an excellent fit for Gailey’s offensive scheme. Will the Jets take another chance on the massively talented 35-year-old quarterback? Only time will tell, but at first glance Vick appears to be a fit. 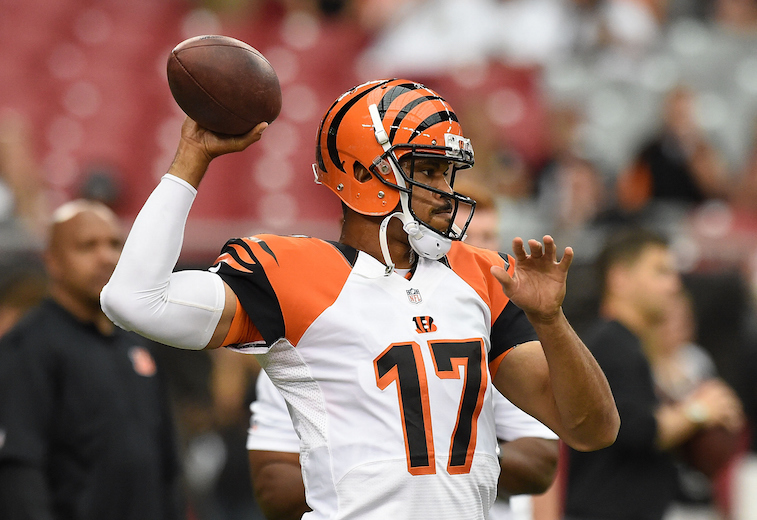 Campbell is currently a free agent after spending the 2014 season as the backup quarterback with the Cincinnati Bengals. Over the course of his nine-year NFL career, Campbell has made 79 starts and proven that he can effectively manage an offense. With that being said, Campbell can best be described as a game-manager more so than a game-changer, which could make him somewhat unattractive to the Jets. 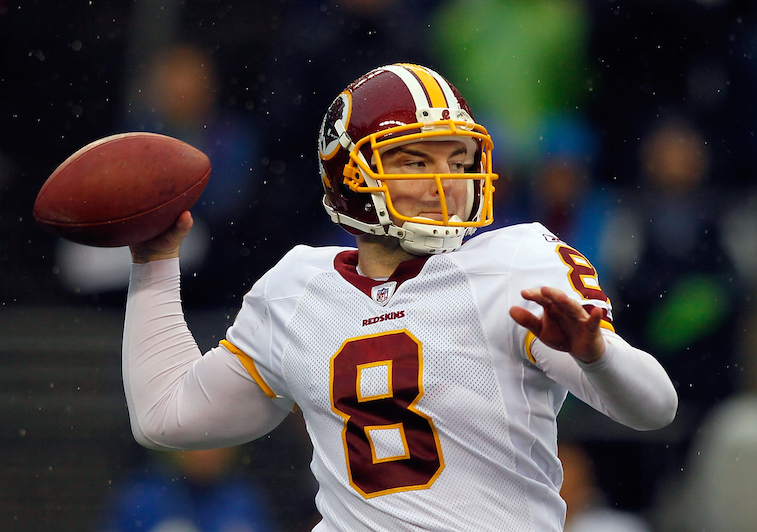 Flynn has vast experience backing up some of the best quarterbacks in the NFL. 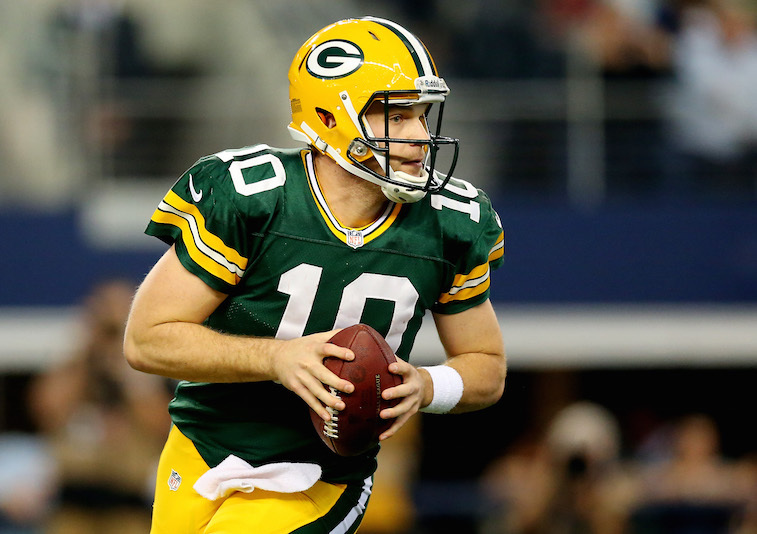 However, outside of one game in 2011, he has been ineffective as a starting quarterback at the professional level. That one good game was enough for him to land a hefty contract from the Seattle Seahawks in free agency, but he signed his contract in the same year that the team drafted Russell Wilson, and Flynn never actually started a game in Seattle. As far as the Jets are concerned, Flynn would provide a veteran presence, but he simply wouldn’t be a noticeable upgrade over Fitzpatrick. The Jets have reportedly already reached out to Grossman, who was out of football in 2014, to gauge his interest in joining the team. According to reports, Grossman is dealing with an injury he sustained while training and would need at least a couple of weeks to get up to speed before he would be ready to compete for the job in New York. While Grossman’s injury likely means that the Jets will go in a different direction, there should be no discounting the fact that the team chose to reach out to him before anybody else.